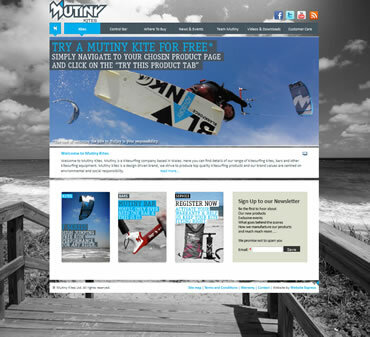 To project manage the specification, design and build of a website to promote the company and products of Mutiny Kites; a brand new kite surfing equipment manufacturer. The brief included finding a web development company to build the site and considering how the brand would be marketed online using social media and SEO. The site also had to be visually appealing and exciting as is the nature of kite surfing. The first step was getting an understanding of the functionality required by Mutiny Kites. Understanding the ethos and background behind the company was essential to this project because as well as lots of standard functionality they wanted the website to show the personality and ethics behind the company and products. This allowed Mogi Marketing to explore different ideas and get creative making suggestions that would differentiate the business from other kites surfing manufacturers. Mogi Marketing recommended using the highly regarded Drupal content management system (CMS) for building and administering the website. This was because of the many different types of content that would be required in the site (sponsored rider profiles, videos, blog, news, events and newsletters) and also because the ease of updating, removing and adding any products. In addition the website would require a dealer login area as well as the ability to sell products to the general public. All this functionality can be supported by Drupal with the right development team. For this project Website Express were appointed as the contractors. As well as the functionality of the website it was the responsibility of Mogi Marketing to advise on what social media channels would be relevant and then customise and set these up. Finally, because of the large amount of competition online for kite surfing equipment Mogi Marketing recommended using a dedicated search engine optimisation team to ensure that the copy on the website included the best keywords and some manual link building was done. Coordinating between these teams required an organised approach to everything and it was essential to keep the project on budget and limit new ideas/changes to the project specification to appear once the specification had been agreed. Improved marketing through a Facebook Page to take over from the original Facebook Profile as a social marketing channel.